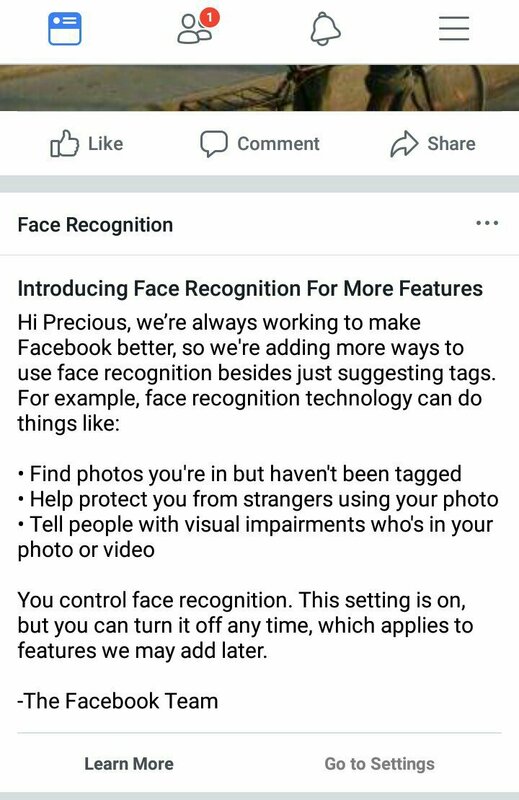 Finally Facebook succeeded in incorporating facial recognition to app, it been long they've working on how to provide maximum security for the users, focusing more on how to track impostors. Facebook always take security and privacy of everyone serious, on this note they have roll out the integration that will protect the privacy of the user. The feature was first announced in December on test but it was fully integrated in February , 2018. These have been confirmed by many user that logged onto Facebook on Tuesday that Facebook have started notifying them on their News Feed of the firm's new facial recognition technology. The face recognition technology feature will help you find photos you are in but haven’t been tagged, it will help you protect you from strangers using your photos and it will tell people with visual impairments who is in your photo or video. Though you can control the face recognition technology whether to turn off or on. The setting is automatic on, but you can turn it off at any time. If you want to secure your privacy then you don't have to turn off. I adopt the new feature and I believe it needed by many users to help Facebook track those culprit that always hack account and use fake photos for fraudulent activities.